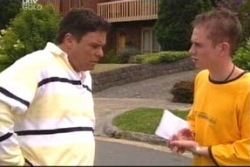 Lyn telling Joe he has to make a speech at the wedding. Michelle shows Connor a tattoo and tells him not to tell her parents. It's a Celtic design and she asks him to read it out to her. He says it says… something. I don't know. She asks what it means and he tells her that the English translation never sounds as good. Like mon petit chou-chou. They hear someone at the door and Connor jumps to his feet, kissing Michelle goodnight before bolting through to the bedroom. Lyn and Joe come in and are a little surprised to see Michelle is still up. Lyn tells her that the doctors can't work out why Joe's lost his voice, it's not as a result of the injection he had. Lyn confides in Michelle that she thinks it's psychological. Michelle says that Joe doesn't believe in all that stuff, but Lyn says regardless of whether or not he believes in it, it's happened. Harold's telling Rosie that she knows just about everyone at the pub. Someone should tell him Susan's the one who will be involved in the amnesia storyline, not Rosie. Harold tells her about the fire which Lou is keen to avoid discussing in depth, then tells her about the photos. When Rosie says of course she does the boys are pleased that she's 'back'. Lou races off to get a brandy and Harold talks to Rosie, ensuring that she knows who she is. Rosie says that if this is some kind of a game he'll need to explain the rules to her, and there's a moment where they're holding hands over the table. Michelle walks in, laden down with more presents for Steph. She offers Joe a bit of chocolate but Lyn tells him not to eat it before breakfast. Michelle says that the chocolate could be good for his throat. Cures many an ill does chocolate. Lyn reminds Michelle that she's got another fitting – Flick's already had hers and was apparently very co-operative. Michelle makes a few quips but Lyn tells her to go and get ready, Libby will be there soon. Joe rings his bell and holds out the bar of chocolate. Michelle declares that it's all old and melting and that she's been ripped off. She goes off to confront the girl she bought it from, only for Lyn to haul her back and demand that she get her frock on. Joe rings his bell and indicates that Michelle should do as her mother says. LYN: I appreciate your help, I wish it were more than sound effects! A young girl rides up on her bike – it's ikkle Summer Hoyland! 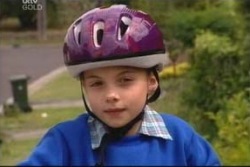 So young, so cute… She gets off her bike and moves the wheelie bins until they're in the middle of the road. When she's finished she sees Libby who asks if she saw who did this. Summer says it was three boys who ran off, and offers to put them back. As she's doing so she asks Lib if she'd like to buy some chocolate. Or some biscuits? It's a fundraiser for the church that burnt down. Libby's guilted into buying some while Summer says hi to the baby. SUMMER: Is it a boy or a girl? Libby's only got a $20 note so Summer says she can have the whole box. Lib can't help but smile as Summer liberates her of the twenty dollars and leaves her with a box of biscuits. Michelle reads out a letter and proclaims that Valda can't come due to gastric problems. Nice. Lyn tells Michelle that she needs to put the dress on. Like, now. MICHELLE: Yeah, well I'm halfway there. LYN: Get all the way there. There's a knock at the door and Lyn lets Libby and Ben in. Connor offers to look after Ben, teach him how to play the computer game and help save the world. LIBBY: Just watch him though, he cheats. Lib gives Lyn the box of biscuits saying there was a girl selling them for the church. Libby asks Joe how the speech is going, commenting that Karl drove Susan mad when he was writing his. One presumes for her wedding to Drew, rather than Karl writing one for Steph's upcoming nuptials. As that would just be weird. Lyn isn't buying it and tells Joe that he'll have to get better, that's all. Lou and Harold are thinking of various ideas when Rosie puts her foot down. She feels like she's the only one not in the secret and she wants to know. Now. Lou announces that he wants to tell her, Harold is the one who wanted to keep it quiet. HAROLD: The truth is… we didn't tell you the truth. OK then… They tell her what really happened at the pub last night and that she said some embarrassing things. ROSIE: Well, did I swing from the chandelier with my knickers on fire or what? Lou says he was actually impressed and Harold asks if she were ever the chairperson of a board to which Rosie says she was. Lyn's putting her foot down, she's not doing the speech. Lib doesn't know why she can't, she's great at public speaking. But she'll be doing it in front of family at her eldest daughter's wedding. Michelle provides the distraction by finally getting into her dress. Lyn is not happy to see that she's wearing a t-shirt underneath it. Michelle first claims to be cold but then admits she hates the dress being sleeveless. As Lyn begins to rant about now not being the time to complain about the design, Joe rings his bell. Lyn tells him to just go to the pub for lunch and to take Connor with him. Michelle says she doesn't want to go sleeveless and proclaims Lyn is horrible before storming out, Libby in pursuit. Lib asks what's going on and Michelle shows her the tattoo. She says it's not real, it's henna, but that it's not coming off. Libby takes her hand and takes her into the bathroom saying henna doesn't wash off, it wears off. Connor asks why doesn't Joe just use sign language as it would be quicker. Joe hands over a note which Connor looks at. Joe hits him and mimes holding a phone and Connor just agrees with him before offering to get Joe an OJ. Rosie and Lou walk in and greet them, Connor having to explain that Joe's lost his voice. Rosie says that Connor's turned into the messenger boy, that's a fair list of numbers that Joe's given him to ring. Lou mentions the wedding and says that Lyn is having a nervous breakdown. ROSIE: Oh it'll sort itself out, these things always do. I remember when I was a professional anaconda wrestler in Ecuador, much the same thing happened. Lou twigs that she's winding him up and Rosie laughs that for a moment he believed her. She says that whatever she said last night must have really got to him before saying that they need to have a talk. Drew tells Summer that all he's got is a $20 which she happily liberates him of, telling him that he can have six packs. Summer cuts off his protests by saying that they're really yummy and that all the people at the church thank him. And so does baby Jesus. Drew wonders why she's not in school but Summer says it's her lunch break, she's class captain, totally trustworthy and they let her do anything. Poor Drew's not too sure what to do with all his new-gained chocolate. Rosie tells Lou that Harold's worked out what's going on between her and Lou and that they need to be honest. Lou wonders if it's best to fudge the truth a little; if the truth is going to hurt someone then a little deflection does no harm. Rosie doesn't see it that way and wants to be completely honest. Libby is scrubbing off the henna tattoo trying to get rid. MICHELLE: You're going to rub my skin off. LIBBY: No, that's plan B. There's a knock at the door and Lyn wants to know what she's doing. After saying that she's just taking off some nail polish that's the wrong colour, Lyn asks where Libby is. Michelle says she doesn't know and Lyn leaves. LIBBY: Oh, now you've made it look like I don't want to help! Libby asks who she was trying to impress before realising it's Connor. Michelle swears Libby to secrecy. Drew pulls up to find the wheelie bins are back in the middle of the street. Lib is racing out of the Scully's back home to get some make up for Michelle's arm. She asks Drew if they were that crazy the night before their wedding and Drew reminds her of Uncle Fergus and his haggis. Joe walks out and reclaims his bin from the street as Connor fills him in on the results of the phone calls. Elvis lives and is in Erinsborough, going to help with a front-end loader. Apparently. As Connor carries on, Libby runs back into the house, make up kit in hand. LIBBY: Your place, haven't you noticed? Summer is counting her spoils and seems to have made a fair packet. She takes some chocolate bars from her bag and walks into the shop. Connor whistles as Michelle comes out in her dress, declaring her a vision from heaven. Libby approves and asks that Connor should give Drew lessons in how to be romantic. Lyn walks in and asks who's being romantic to who. Connor declares he can speak like an Aussie who would apparently chat up a girl by asking if she'd like a lager. Lyn follows Connor into the kitchen and thanks him for being nice to Michelle. He says that they have three beautiful daughters and should be very proud of themselves. He also thinks she should do Joe's speech at the wedding. Lyn says it's not her job but Connor says that if the father of the bride can't do it, the next logical choice would be the mother of the bride. Lyn agrees to give it some thought and then changes the subject – she'd like Connor to be the usher. He gets into the role by "ushering" people to their tables and Lyn says there's a bit more to it than that. She gives him the seating plan which he looks nervously at. Summer's trying to sell some chocolate to Harold by saying that if they want to be like Jesus then they should do charity work. She then asks Harold how many boxes he would like – she has ten, which is $20. He hands over $20 for the biscuits and another twenty as a donation. Summer's thrilled and goes to leave just as Drew comes running up – the biscuits she sold him had weevils in them. Summer says it must have been a bad box. Rosie comes up and asks what Summer's doing out of school. Summer declares that she's fundraising – for her. Rosie replies that she never asked her to before asking Summer to hand over the money for safe keeping. All of it. Summer asks if Rosie's going to tell her father, Rosie says she'll think about it. In the meantime she introduces her friends, Mr Carpenter, Mr Bishop and Mr Kirk. ROSIE: This is my granddaughter, Summer. SUMMER: He must be your new boyfriend then. Is he? Poor Harold doesn't look too happy at this. Lyn is practicing her speech and is a little bit nervous. More than a bit. LYN: It's not every day your eldest daughter gets hitched… When they're little you don't ever think about them getting married at all. I didn't anyway. I always thought of Steph as being a kid in rompers who would be following me around, hanging onto my legs. Then you blink and she's a woman who's so beautiful it nearly stops your breath when you catch sight of her. She walks over to Joe and links arms with him. LYN: When Stephanie was born, I wanted everything for her. Wealth, fame, a career. And a Lamborghini to run around in. Now she's a woman and I've realised all I want for her is happiness. It's the only important thing and sometimes it's the hardest thing of all to get. So standing here, in front of you all today, I want to tell her in front of everyone how much her mother and I love her and are proud of her and how if I could give her anything in the world I would give her happiness. But that's something you have to make for yourself and I know that my daughter, Stephanie, and Marc are going to do that. I pray for that anyway. Lyn compliments Joe on his writing skills and says it's perfect.